Draw the draft on a folded sheet of paper. Draw perpendicular lines from points A, C and B. On the perpendicular line at A, mark points D and G such that A-D = A-C and D-G =4”. On the perpendicular line at C, mark points E and H such that A-D =C-E and D-G =E-H.
On the perpendicular line at B Mark point F such that B-F =A-D. Produce Line B-F to O such that F-O=5”. Join points D-E-F and G-H.
On the line E-H mark point J such that E-J = 1½”. On the line E-F Mark point I such that E-I = 1½”. On the line G-H mark K such that H-K= 1”. Mark P on the I-P such that P-O =1”. Join F-P by a curved line as shown in the figure. Join I-J-K by a curved line as shown in the figure. On the line A-B mark N such that A-N = 3” or to taste. Shape front neck by curve L-N.
On the line A-B mark point M such that A-M = 2”.Shape back neck by curve L-M.
Cut along the line G-K-J-I-P-F-B. Cut back neck shape by cutting along the curve L-M. Separate front and back of the draft by cutting along the line M-N-C-B. Keep one portion which has got no markings aside. This is back draft. 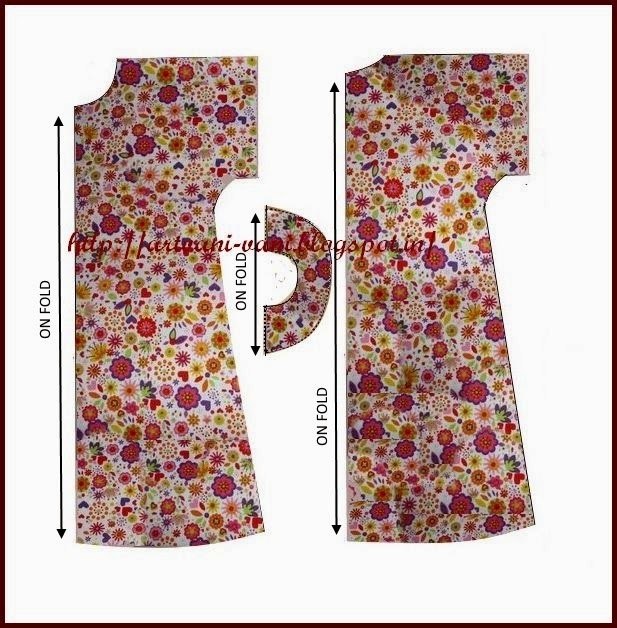 On the other portion the draft cut front neck shape L-N. This is the draft of the front. 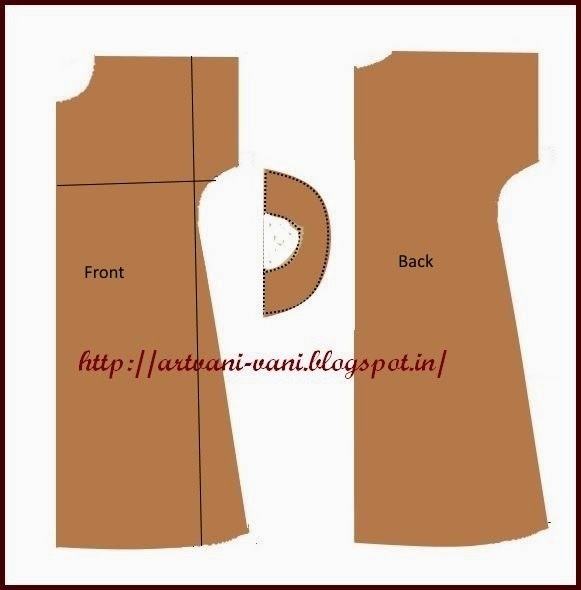 Cut draft of neck facing as shown in figure 3.I have explained HERE in detail. Stitch neck with fitted facing as explained HERE. Stitch bottom by folding ½” inside. 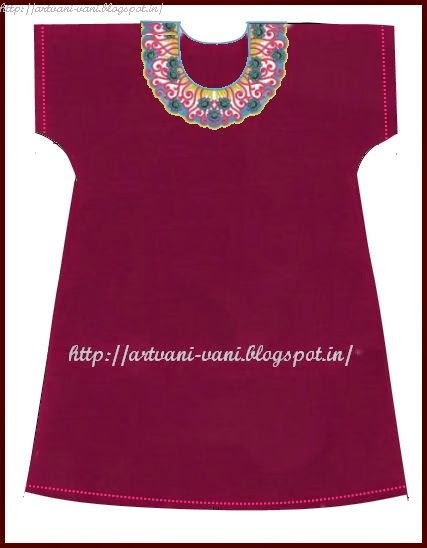 You can decorate neck with embroidery. I like this method of sewing. It is so much simpler. 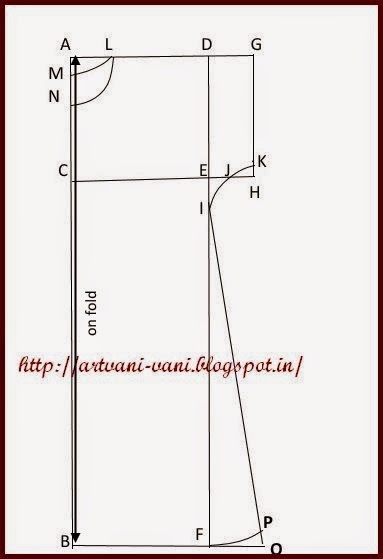 Dear vani ma'am, your tutorials are great help to me. Could you please tell me how to stitch front (center) open kameez and bell sleeves. thank you so much for ur noble service which helps so many helpless people. i have stitched an overlap nighty with putty al around the neck.the problem is the putty is either getting curled or creased. why is it so? Also when I stitch round or U neck , the neck sags , it does not hold in place. Please help. your tutorials are very very useful to me and others. when i have a doubt I refer ur tutorials.u done a very good job. please continue ur tutorials.we are thankful to u.god bless u mam.